Long before people have inked their bodies with automatic tattoo guns, there was hand-tap tattooing first. It is an old method of marking the skin with sticks (i.e. bamboo, animal bones, etc.) as the gun, needle, and natural dyes. The tattooist taps the stick repeatedly to deposit the ink into the skin, which many felt it is more painful than machine-operated tattooing. Ancient civilizations from around the world did practice the art of hand-tap tattooing, but this art continued to live on in some indigenous cultures in Samoa, Borneo, Philippines, among other islands in the Pacific. 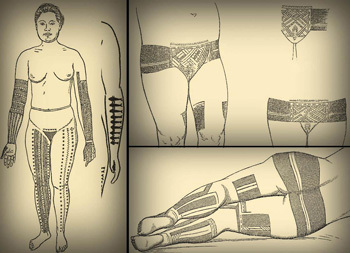 Samoans call this body art "tatau" which is supposed to mean "to tap" in English, however, Western explorers have had a hard time enunciating the word; hence, they were reckoned to call it "tattoo". Indigenous tribesmen used this traditional method to 'paint' symbols on their body. These designs and symbols are ought to represent the personality, experience, and role/status of an individual in his tribe. The tattoos are usually inked on the chest, shoulders to biceps, legs, and face. For instance, tribal warriors from Kalinga, Philippines used to be tattooed by the "Mambabatok" of the village, after successfully killing an enemy. Tattoo is like a badge of honor they deserve to get after winning the war against the tribes of Sagada and Bontoc. With its rich history, to be tattooed by a true-blooded hand-tap tattoo artist in his natural environment is like a rare gem for a lot of people. However, hand-tap tattooing is a dying tradition in a lot of indigenous cultures in the West. Direct descendants of tribal tattooists choose to pursue other career paths brought about by modernity and Western influence. Fortunately though, there has been a revival of tattooing in general since the last two decades, and many fans of body modification are gaining interest in this old tradition. Many tattoo artists even travel across the world to learn more about hand tapping and try to bring it closer to their local communities. If you want to represent a piece of tribal history on your body, you can pick among these popular designs to get started. 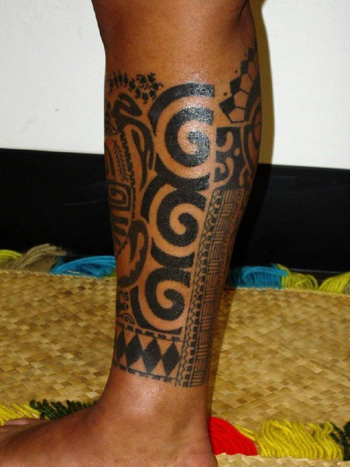 Samoan tattoo designs are inspired by sea artifacts like turtles, sea shells, fishes, etc. These figures symbolize long-life, abundance, and peace. Some elements of nature like the sun and ocean (e.g. waves, spirals, etc.) are also popular as well as images that show valor and femininity. In rare occasions, you may also see "Marquesan cross" in a Samoan tattoo design, which is the local's way of representing the balance among all natural elements. Originating from Borneo, Iban tattoos by Dayak peoples are characterized by its large-size representation of spiritually-charged figures of humans, animals, and plants. Floral motifs are common which is then accompanied with images of animals and plants. Iban tattoo artists communicate with their spirit guides first in an effort to come up with a tattoo design. 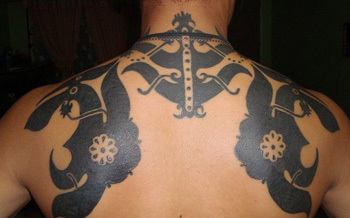 Tattoos are performed on a Dayak person either for ritual or head-hunting purposes. The grueling session could last up to eight hours, depending on the size of the tattoo. Also known as "Batek" in the Philippines, tattoo designs from Kalinga are inspired by the courage of the tribal warriors. Back when head hunting was still allowed, warriors who were able to sever an enemy's head would earn a bikking or chest tattoo once they come back home. The design shares great resemblance with armory albeit more on the abstract end. There are V-shape markings to show the image of an oracle eagle, the messenger to God Kabunian. Mainly derived from Aztec and Mexican influences, these designs are easily identified by their black and grey shading as compared to the blue and black of Pacific Islanders. Aztec tattoos represent passage rites, social status, and war achievements, all of which were also done in honor of their local gods. 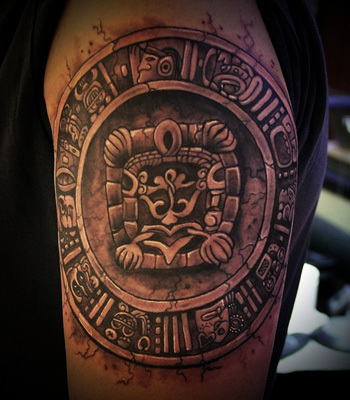 For example, the sun in a tattoo design represent the sun god Huitzilopochtli, serpent for the most powerful Quetzalcoatl, and warrior images for representing Tezcatlipoca. Other popular symbols include eagle which symbolize strength, Aztec calendar, and some elements of nature. 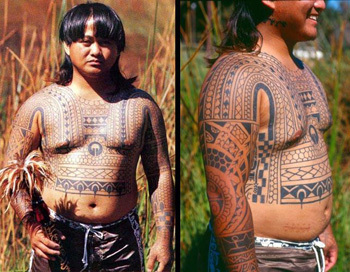 Perhaps, tribes from Micronesia have the most interesting hand-tap tattooing customs and traditions. Women can have the so-called vulvic and buttock tattooing, which can be re-done every time they give birth, to keep the abdomen tight as well as for beautification purposes. In most cases, the islanders imitate what they see surroundings for their tattoo designs, but the representation would vary depending on where the tattoo is placed. For example, a tattoo on the face would indicate a person's rank in society. Dolphin tattoos are also common among men for it represents protection against the sharks as they sail out for fishing. The growing interest of people in hand-tap tattooing is probably enough to revive this old form of body art. Modern tattooing has approximately 250 years of history compared to hand tapping's archaic beginnings, which makes it a fascinating subject matter. Interestingly, the hand tapping scene is still very much alive in some parts of Borneo, Hawaii, and Polynesia. But if you want to meet a female hand-tap tattooist whose experience encompass the 20th century head hunters and the new millennia, go visit Kalinga, Philippines and look for the 93-year old Whang-Od. Overall, the tribal tattoo designs above hold great social and cultural relevance to those indigenous tribes. For some tribes even, the tattoos are spiritually charged so wearing them comes with a great responsibility – to be respectful of nature.